Update: The Iowa Insurance Division explained March 21 that spokesman Chance McElhaney went on paternity leave at about the same time as his initial March 6 response and our follow-up questions that day and March 8. Out of fairness, the story has been updated to remove references to specific inquiries going unanswered. An Iowa collision repairer’s correspondence calls into question statements in a letter by the IMT Group that apparently persuaded the Iowa Insurance Division to close the shop’s complaint against the carrier. The same letter indicated the IID would close the case without any action against IMT. 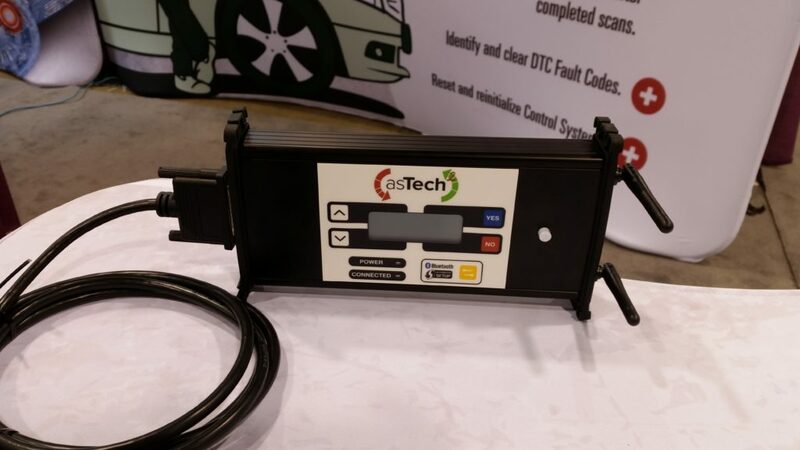 Precision Collision estimator Mark Jaeger had complained to the agency in October 2016 following recent IMT refusals to pay for scans of FCA and General Motors vehicles dating back to the 2012 model year. In November 2016, the agency asked for specific claim numbers so that IMT could respond. Jaeger sent them six claim numbers and/or customer names. One was paid by the insurer, and is therefore moot. One was in the process of being repaired. But IMT senior claims manager Jim Todd’s account of the other four — in a letter that was carbon-copied to IMT CEO Sean Kennedy, Vice President of claims Chris Owenson and claims director Tim Welch — is where the repairer’s and insurer’s stories really differ. Unfortunately, the insurance department assured Jaeger that any records of the shop and carrier’s interactions would be provided by the insurer, and not to bother with sending his own documentation. “We will not need the documentation you mentioned as the company should already have it,” Peters wrote Dec. 14, 2016. Relying on the accused’s evidence alone does not seem like the most logical way to conduct an investigation, and in this case, it might certainly have been a mistake. Notes and emails provided by Jaeger to Repairer Driven News directly contradict the account in Todd’s Dec. 29, 2016, letter to the agency. Below are the IMT description provided to the agency, followed by what Jaeger’s notes indicate. Customer names and claim numbers have been redacted for privacy here even though they’re part of the Iowa public record. Discrepancies are italicized. FCA and General Motors position statements call for pre- and post-repair scans regardless of the damage. That said, we’ve also provided the number of repair order hours and estimate costs for additional context into the severity of the four claims. These weren’t sub-deductible hits; all four exceeded average repairable claims costs typically reported by CCC and Mitchell — further supporting Precision Collision’s stance regardless of position statements. Precision Collision notes and emails, OEM statements, September 2016-January 2017: On Sept. 26, 2016, Jaeger emailed a senior field claim representative about GM’s August 2016 announcement that it was working on a position statement and agreement that a dash light wasn’t a diagnostic tool. The IMT claims rep on Sept. 27 acknowledged this, wrote “I have forwarded it to our Physical Damage department for review,” and provided an estimate. On Sept. 28, notes indicate Jaeger called the insurer to say that he agreed with most of the estimate. On Oct. 7, 2016, Jaeger called IMT to tell the insurer he’d forgotten to send a scan invoice and emailed it to them. On Oct. 14, he emailed the IMT rep to see if she needed any other information on the claim, as he hadn’t seen a check. Jaeger left a message for the IMT rep on Oct. 17. 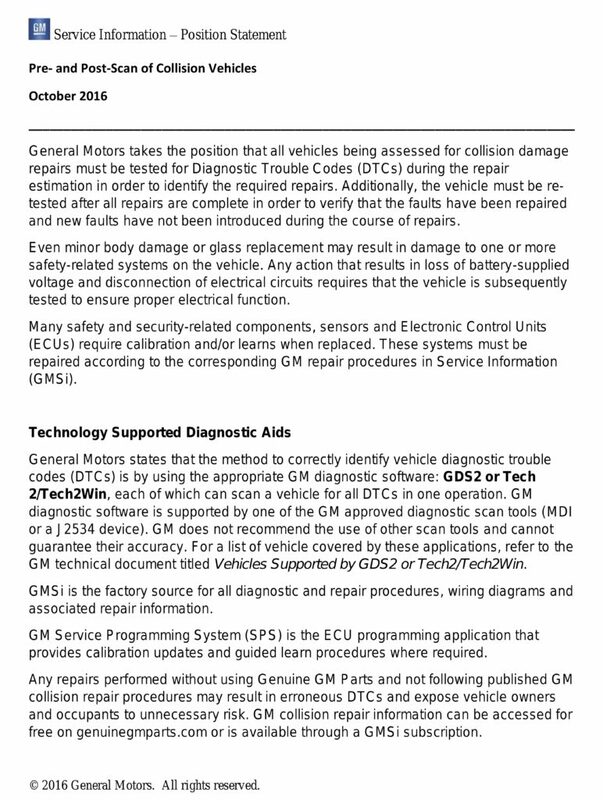 On Oct. 25, Jaeger emailed the claims rep a copy of GM’s scan position statement. “Again I’ve sent you this documentation, I’ve proven it’s required, that we’ve done it, and once again if we’re going to do the ‘We don’t pay for that’ then I’ll need a copy of the policy that states that, I’ll also need a representative from IMT to sign this scan authorization (just initial next to the refusal portion and sign and date) If we don’t do this and something happens we need proof that IMT knows more than General Motors,” Jaeger wrote. On Jan. 10, Precision Collision contacted the IMT rep again about a missing $733.65 it said IMT owed the shop. 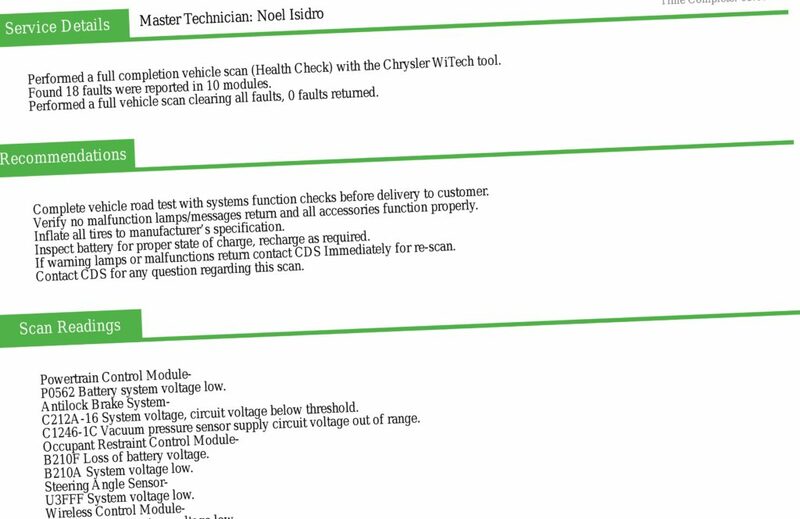 On Oct. 26, 2016, Jaeger wrote to a different IMT claims representative, stating “Chrysler requires this vehicle to be scanned before and after repair.” He also indicates that a radiator support and headlight are to be replaced, two conditions which Chrysler suggests could trigger diagnostic codes. On Oct. 27, the IMT rep emailed Jaeger: “Wadena/ IMT will not be signing anything in regards to a scan. It is not necessary (at this time) in order to put the vehicle into pre loss condition. Once the repairs are paid for, per our estimate, I anticipate that you will release the vehicle to the vehicle owner and cannot hold it from the customer. 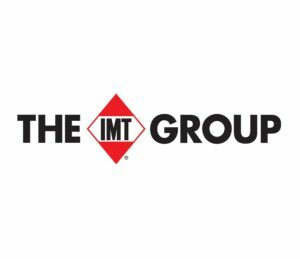 On Oct. 28, an IMT claims supervisor told the shop that IMT “would not be compromising on any of these items without a prior discussion. At that point, or adjuster will prepare an estimate per our estimating guidelines and work with you on those items that may warrant a further discussion. A Nov. 3 Collision Diagnostic Services completion scan found 18 faults in 10 modules (and a blown radio fuse). On Nov. 4, Jaeger’s notes indicate he called the rep and provided the scan invoice and other bills. On Dec. 28, the notes indicate the shop called the IMT rep and asked for payment. On Jan. 6, 2017, it emailed her again. On Jan. 20, 2017, the shop called the IMT rep again about a supplement check that didn’t match one it received from her. Precision Collision notes and emails, OEM statements, June 2016-January 2017: On Nov. 14, 2016, Jaeger called IMT and presented a preliminary estimate. On Nov. 18, an IMT staffer denied the scans and was expected to email an estimate sometime in the future. On Dec. 8, Jaeger left a message for the IMT staffer. On Dec. 9, 2016, Jaeger sent a supplement and numerous photos. On Dec. 12, he discussed potential mechanical issues with IMT. 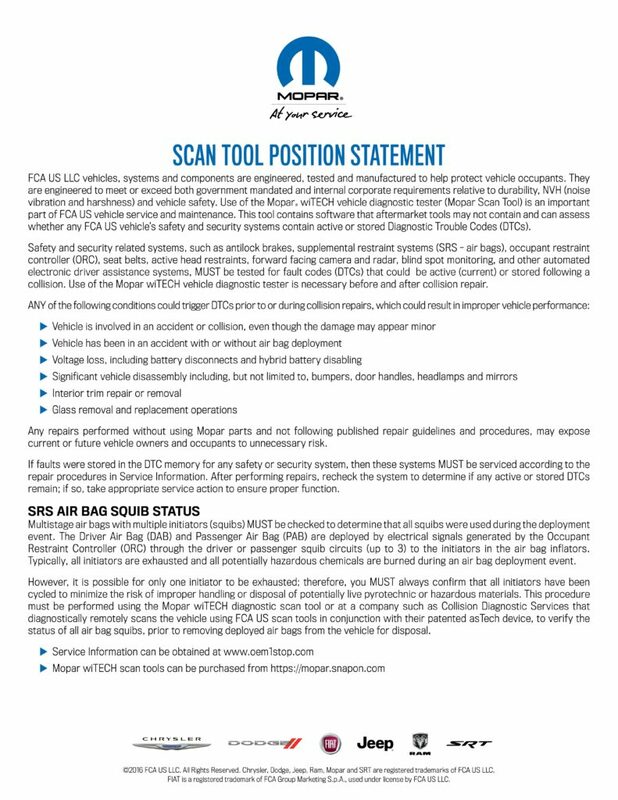 On Dec. 21, Collision Diagnostics Services performed a completion scan. They found 15 faults in 3 modules. On Dec. 22, Jaeger sent the supplement of record, the scan report and invoices to the company. On Dec. 27, IMT sent a final estimate. On Jan. 11, 2017, Jaeger called the IMT staffer and left a message. Precision Collision notes and emails, OEM statements, October 2016-January 2017: The loss occurred Oct. 10, 2016. The earliest note listed is Oct. 25 — four days after General Motors issued its “pre- and post-scan all vehicles” position statement. An Auto Damage Appraisers of East Iowa estimate lists a contact date of Oct. 26. While not contained directly in the notes provided to Repairer Driven News, Jaeger recalled in an email that he gave the appraiser a copy of the position statement during his visit either Oct. 31 or Nov. 1. On Nov. 3, the appraisal company emailed Jaeger, noting that any supplements needed prior approval from it and documentation supporting the work. On Nov. 19, Precision Collision contacted the appraiser about the remaining balance. On Nov. 23, the appraisal company said it received the supplement and would have a review of it done by the end of the weekend. Finally, on Jan. 27, 2017, the shop contacted the appraiser wondering why no payment had been issued and asked what else needed to be provided. 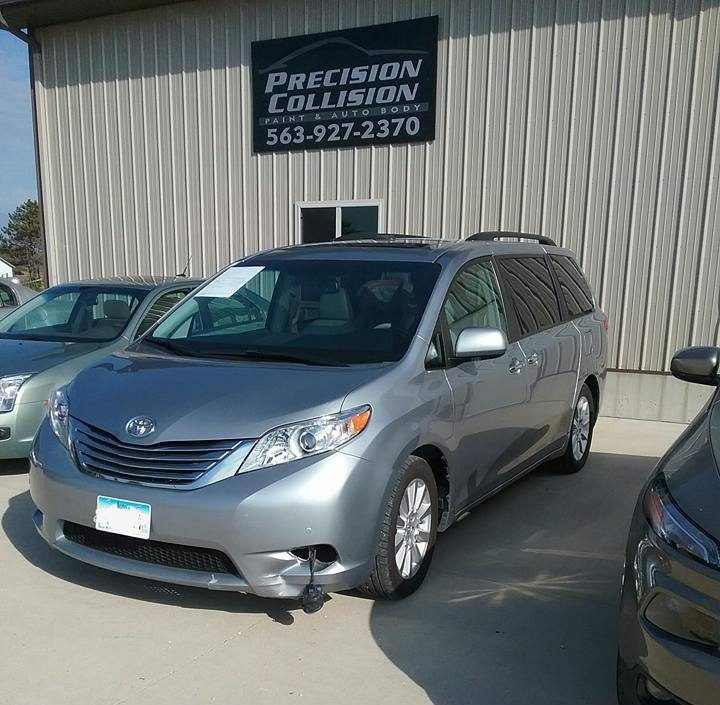 If Precision Collision’s notes are accurate, they call into question either IMT senior staff’s account to the Iowa Insurance Division or what the executives were told by underlings in producing those responses. Neither scenario reflects particularly well upon the carrier. IMT’s dismissal of the need for diagnostic scanning in the face of the collision severity indicated by the estimate costs and repair hours also casts doubt upon IMT and at least one of its third party appraisers’ capability to estimate damage for IMT’s policyholders. Besides calling into question the regional carrier (and the insurance division), the dispute also reflects the importance of shops keeping good notes. In this case, the Iowa Insurance Division unfortunately relied primarily on IMT’s notes — but the shop’s documentation could be useful in a formal courtroom, which was the IID’s suggestion for resolving the dispute anyway.